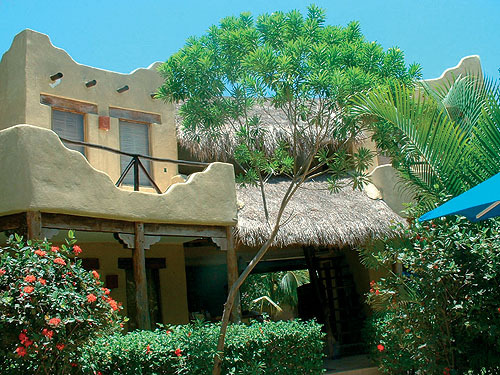 Learn Spanish in Playa del Carmen at our partner Spanish school, Don Quijote. Don Quijote is located just a short distance from Playa del Carmen's beautiful white sandy beaches and is built in the traditional Mexican style. Don Quijote has a relaxed but professional atmosphere making language study very easy. Thanks to the region’s year-round temperate climate, classes take place under thatched roofed learning areas surrounded by tropical gardens. The Mexican Caribbean is one of the best places in the world to scuba dive and snorkel. Arrangements can be made for those who would like to experience the natural wonders of the Caribbean Sea. Students can learn to dive in a few days. All levels of certification are available. The minigroup programme with 20 or 25 lessons per week (1 lesson = 55 minutes) respectively consists of classes with a maximum of 8 students per teacher. The course with 25 lessons consists of the 20 regular Spanish classes and 5 culture/conversation classes. If you have any dietary restrictions (lactose intolerant, vegan, gluten-free etc) please let us know. Teaching materials can be borrowed by leaving a deposit of € 37. This amount will be refunded at the end of the course. You can also buy books at the school. In 2019 the school is closed on: 01/01/2019, 04/02/2019, 18/03/2019, 18/04/2019, 19/04/2019, 01/05/2019, 17/05/2019, 16/09/2019, 01/11/2019, 18/11/2019, 25/12/2019. Missed lessons due to bank holidays will not be refunded or rescheduled. If two holidays fall in the same week, one day will be made up and individual lessons will always be made up. Playa del Carmen is a beautiful destination for many water sports. Besides kitesurfing, it is also possible to combine your Spanish course with diving lessons. If you are a beginner, you will take the course PADI Open Water. This course includes 4 half days of theoretical lessons and 4 practical diving lessons in open water. Prices and further information for this course are upon request (info@studytravel.com). The number of students during the diving lessons depend on the level and season. For the more experienced divers, the Spanish and Diving advanced course in Playa del Carmen will make it possible to learn Spanish and at the same time enjoy the beauty of the undersea world. The diving lessons include 2-3 days of theoretical lessons, plus 5 real dives in open water. Prices for this course are upon request (info@studytravel.com). This course is perfect for those who want to optimise their study time. The aim of this program is to offer a fully personalised method of teaching designed to meet your specific needs and desires. As the classes are private, you will be able to decide the schedule and content. Carefully selected host families provide a home away from home. This gives students the opportunity to further appreciate the beauty of Mexico and its people. The host families are located within 20 minutes walking of the school. Some host families provide their students with bicycles, so they can get around the city and to and from the school easily and quickly. Students can also rent bikes at the school for $1 USD per day. The residence is a beautiful Mexican Hacienda style house located in close vicinity to the school, in about 2 minutes walking distance. The residence is also just an 8 minute walk from the beach and Fifth avenue. All rooms have air-conditioning and a private bathroom. There is a shared kitchen which everyone can use and a comfortable sitting room and dining area. You can also use the Wi-Fi. The residence has a communal kitchen for self-service only. When you wish to book breakfast, you will have it at school. In Playa del Carmen you also have the possibility to share an apartment together with some of your fellow students from all over the world! Here you can choose to stay in a single or double room, altough double rooms are only available for two students travelling together.